We take pride in stating that we are one amidst those highly reputed real estate firms who have made it big in this dynamic industry. We are highly acknowledged among our clients for offering the Hmda open plots at Gachibowli as we are known for keeping in pace with changing times and strictly adhering to our commitment to quality and time that has been extra ordinarily characterizing Srr fortune infra pvt ltd. The host of facilities near our Hmda open plots near Gachibowli, like the Bus Stations, International Schools, Hospitals, Star Hotels, Shopping Malls, etc. has created a route to our customer’s heart and so has attracted many footfalls. Address: 8-3-214/19/GB, Plot No. 19/A, Srinivasa Nagar Opp. BMB Bank Road, S.R.Nagar, S R Nagar, Hyderabad, Telangana, India. This Broker Profile page for "SRR Fortune Infra Pvt Ltd" has been created by PropertyWala.com. 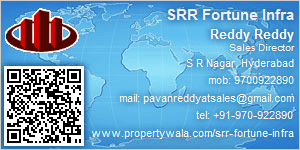 "SRR Fortune Infra Pvt Ltd" is not endorsed by or affiliated with PropertyWala.com. For questions regarding Broker Profiles on PropertyWala.com please contact us.